Barrie Rose, whose sustained effort to improve the environmental performance of the South African trawling fleet over a period of 30 years resulted in several major gains for the environment, has passed away in Cape Town. Barrie was fatally injured after a fall from the rocks while fishing at Cape Point on Friday 30 December. That Barrie lost his life while doing what he loved best will come as some consolation to those who knew him − fishing was an abiding passion and he pursued it relentlessly and successfully; it was common for Barrie to be the only fisherman to land a fish when scores of others were giving it their best shot. Barrie worked in fishing for 41 years. He began his career at Sea Fisheries (now the Department of Agriculture, Forestry and Fisheries) where he was employed for 23 years, initially as a pupil technician. He began to learn about trawling and interact with the deep-sea trawling industry when he transferred to the demersal section at Sea Fisheries in 1980. He played a key role in the annual demersal surveys and it was Barrie who established the demersal database that exists to this day. Although he was offered several jobs in the fishing industry, it was only in 1990 that Barrie made the decision to leave Sea Fisheries, choosing to join I&J as production manager in the trawling division. His job was to optimise the use of the company’s quota and in this role he was able to reconcile his passion for the environment with his job; he worked tirelessly to ensure that fishing was conducted sustainably and responsibly. For instance, it was Barrie who introduced the idea of marine protected areas (MPAs) as a means of fisheries management to SADSTIA. Only last year the Department of Environmental Affairs announced its intention to declare 22 new MPAs in South Africa and SADSTIA has participated meaningfully in the process of defining their characteristics and boundaries. 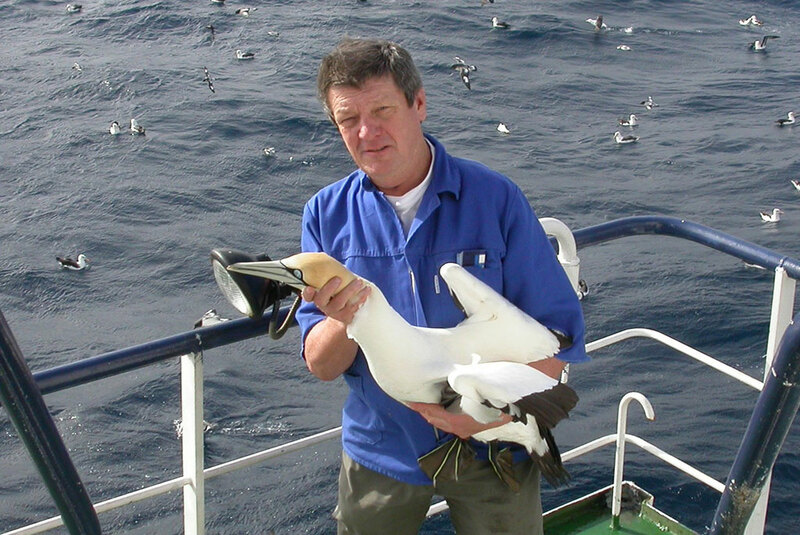 Barrie also facilitated a study that identified the fact that seabirds, especially albatrosses and petrels, were regularly killed by trawl warps. He was instrumental in finding a solution to the problem and between 2006 and 2014 SADSTIA members recorded a remarkable 99% reduction in the number of albatross deaths caused by trawl gear. Throughout his career at I&J, Barrie enthusiastically located berths on fishing vessels for marine mammologists, ornithologists and ichthyologists, an initiative that resulted in the development of a new class of environmentally conscious skipper in the deep-sea trawling industry. Barrie retired in 2008 and spent the past eight years pursuing his interest in birds, nature and the oceans. He was one of South Africa’s top 10 bird watchers and spent a considerable amount of time identifying and photographing seabirds. He was involved in the compilation of the seabird portion of the renowned field guide Sasol Birds of Southern Africa, and helped to compile the “Seasonal Table for Seabirds” in Essential Birding and the Southern African Birdfinder. He also served on the South African Rareties Committee. As an international fisheries observer, Barrie worked on fishing and seismic survey vessels in some of the most remote and far flung reaches of the oceans. He leaves his wife Roselle and two daughters, Lee-Anne and Lynne.